Question: My firm wants to go to a central email address so every attorney does not get an individual email. How do we do that with efiling? Example, when I file a document my boss gets a notification - he wants it where it goes to a central email and not be notified unless he accesses that particular email address. Can we do that? Answer: If your firm is a sole practitioner, you could change your attorney's email address to something generic like eservice@[lawfirm].com. You could then retrieve any eServices sent to your attorney at this email address. Of course, if your attorney ever needs to eFile, he/she would need to login with this email address and the associated password. However, it sounds as if your firm is larger than this and this solution is not an option. The reason this is not an option is because the eFileManager system allows for only one person per email address so something like eservice@[lawfirm].com is not an option. They can choose to NOT receive a number of notification emails from eFileManager. Set up rules in Microsoft Outlook, if your firm uses that email client program, to direct unwanted emails into a folder other than the attorney's In box. We will cover each of the three suggestions below. After logging in as the attorney at www.filetime.com, click My Accounts and then click Notification Preferences as shown in the screen shot below. Deselect all of the Notifications that the attorney does not want to receive. Click the Add new record if you want copies of the Notifications to go to a different email address and add as many additional destination email addresses as needed. As a firm eFiling administrator, login to www.filetime.com. Click the Admin button on the top navigation bar and then click the Service Contacts button on the sub-navigation bar (see screen shot below). Find the name of a firm attorney to highlight his/her name. If he/she is not on this list, click the Add Contact button and add him/her. 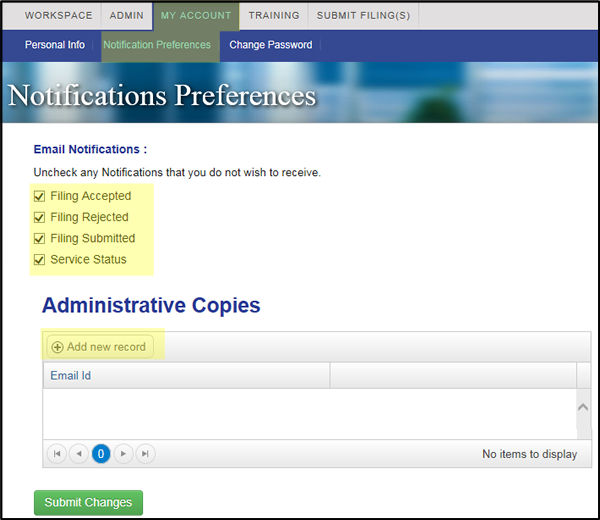 In the Contact Details section on the right side, add an email address in the Administrative Copy area to which additional copies of eService Notification emails should be delivered. From now on, when counsel serves this attorney, an additional copy of the notification email will go to the email address you just entered. If your firm uses Microsoft Outlook as your email client, you can makes rules in each attorney's Outlook to direct any eFiling or eService notification emails to a folder other than the attorney's email In box. This will prevent him or her from seeing them at all.